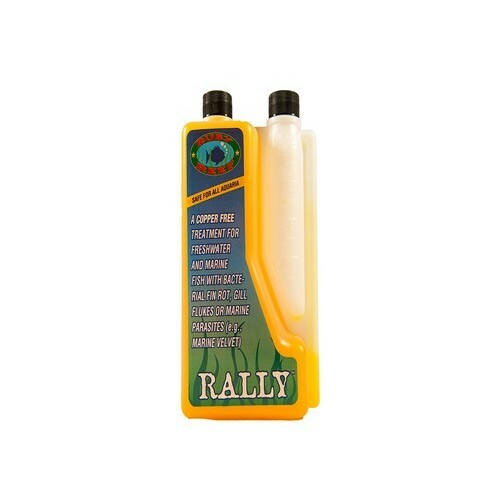 RALLY ™ is safe for reef, marine, freshwater and planted aquaria. After three years of development and testing, RALLY ™ has been on the market since 1998 and has been unequivocally proven to be safe for fish, corals, invertebrates and plants. RALLY ™, whether used alone or in combination with KICK-ICH™, has no impact on biological filtration. RALLY ™ is safe and effective for rapid control of dangerous and destructive infestations such as marine velvet. RALLY has a long shelf life at room temperature and is supplied in regular and easy to use, self-dosing bottles.